April 11, 2016, 3:02 PM · Everyone should have a Baroque bow! What is what Rachel Barton Pine said last week in our interview on Violinist.com. She made such a passionate and convincing case; furthermore, she shared that it's possible to buy a decent-playing bargain Baroque bow on Amazon for as little as $45. What Rachel said is true: it is much easier to play string crossings, certain gestures, double stops, voicing, etc. with a Baroque bow because of its unique shape and nimble nature. Here is some of the repertoire that instantly felt more do-able: the last movement of the Bach Violin Concerto in A minor; every single page I flipped to in the Sonatas and Partitas; even pieces from the Suzuki books like the Veracini Gigue and Fiocco Allegro. I still had questions, so I consulted Baroque violinist Tricia Ahern of the Canadian-based Tafelmusik Baroque Orchestra, who helped me find some answers. She is a true expert, and for those who are interested in Baroque music, she and her colleagues teach during the summer at the Tafelmusik Baroque Summer Institute. Below is a little video of me talking about the bow, and below that, Tricia's helpful answers! Laurie: Why are Baroque bows so short? Mine is about 27.5 inches. Is that a normal length for a Baroque bow? Do they get shorter? Tricia: Baroque Music and the equipment that played that music had a reciprocal relationship. In other words, music changed the equipment and the equipment shaped the music as well. The length of 27.5 inches is the length of my baroque bow as well, but I also have a shorter earlier dance bow that is 25 inches. They didn’t have a standardized length for bows, so you can see a big range of lengths. All bows were short until about 1710-1720. The bow-maker Stephen Marvin mentioned that the bows were basically the size of the case of the instrument…very practical indeed! Baroque violinist Tricia Ahern, right, answers some questions from Laurie, left. Laurie: Do most luthiers know how to re-hair a Baroque bow or do you have to take it to someone special? Do Baroque specialists use different kinds of hair, or just the same as for modern bows? Tricia: I would take a baroque bow to someone who knows how to do a rehair on a baroque bow. It is slightly different to rehair than a modern bow. The hair is the same as a modern bow. Laurie: Mine came with no leather. Is that normal? Is it okay to put some on, or would true Baroque artists find that uncool? Tricia: I do not have leather on my baroque bows, and you don’t need it. Normally baroque specialists do not add leather to their bow. Laurie: Do most Baroque bows not have a slide on the frog? (That pearl front-piece) If that’s the case, is there a reason? Tricia: Bows with removable frogs (clip-ins) were very common in the baroque, but the screw mechanism was developed around 1740, so we just use that technology to make it more practical. With a clip-in, the tension on the bow can vary dramatically with humidification, so it is very impractical if there are weather changes. I have little pieces of leather that I use as a shim to make the bow tighter on my removable frog bow. 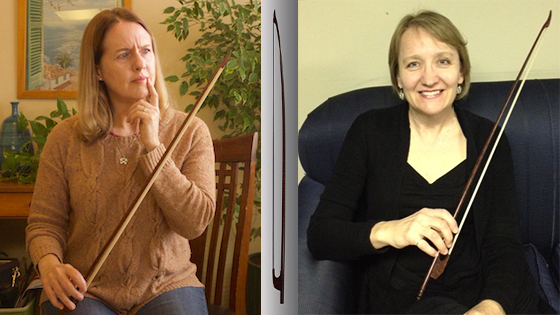 Laurie: Am I supposed to hold a Baroque bow any differently? Tricia: Yes, I choke up on the bow a bit more than on a modern bow, and also my right elbow is lower with a baroque bow. It is really fun to learn the differences of the bow and the nuances that are possible. You have many different bowing techniques with the bow based on what we know from treatises. A couple of sources to start with are by Geminiani and Leopold Mozart. Laurie: The tip is so clearly different. Is that what makes the difference in the way it feels? Why is it so pointy? Tricia: The tip is pointy because it makes the bow have a different sound at the tip and at the frog. In other words, it was desirable in the baroque time to have down bows be stronger than up bows. Bowings are a very important part of baroque performance practice! Yes, the bow feels lighter and easier to maneuver than a modern bow. It has so many possibilities to use articulations and gesture that are so essential to good baroque playing. The pointy tips were also an artistic way to make the bow look graceful and elegant! Laurie: Rachel was recommending against pernambuco for a Baroque bow, is that the typical view, that snakewood is better? Why? Tricia: There are a few remaining original baroque bows, and they were never made of pernambuco. Most were made of snakewood, which is why the baroque bows today are made of this wood. There are many websites that can give you info on baroque bows. Stephen Marvin, a great bow-maker here in Toronto, has a website, historicalbows.com that has lots of information. Laurie: Any recommendations on what I should play first, to get used to the Baroque bow? Or just to have maximum fun with it? Tricia: My first piece I ever performed on a baroque bow was a Brandenburg concerto with modern violin and a baroque bow at Northwestern as an undergraduate. I loved the feeling of playing fast notes so easily. At Indiana University I took the baroque violin in my hands and played solo Bach as my introduction to gut strings with the baroque bow. I immediately fell in love with the sounds and feel of the combo, and the rest is history! Laurie: Different rosin needed, or no? Tricia: I use the same rosin. Tricia: Try to explore the different articulations of the baroque bow. In other words, don’t try to make the baroque bow produce the same sounds you are used to with the modern bow. Have your bow teach you what is possible, what is different, and educate yourself about the history and technique of bowing. It is very different from our typical modern approach, and it is really fun to discover the differences. At our Tafelmusik Baroque Summer Institute, I teach the violin classes that contain the students who are new to baroque violin, and I always love to introduce them to baroque playing! April 12, 2016 at 05:30 AM · Thanks so much, Laurie. I appreciate the references so I can learn more. April 13, 2016 at 11:21 PM · Steve, I don't think it's quite as easy to find a transitional bow, but I'm sure it would be very eye-opening! Rachel Barton Pine talked about that as well, she is a true connoisseur of the bow! April 16, 2016 at 06:31 AM · I recognize quite some of the experience from when I switched to an Arcus bow. It's the best of both worlds. To give my students the 'baroque' feeling I sometimes let them hold the bow a bit further on the stick, which makes it shorter and lighter.